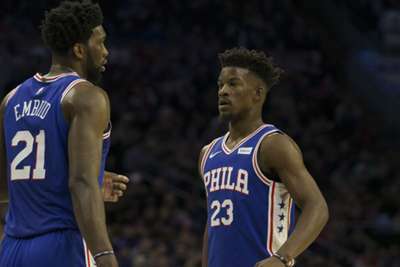 Philadelphia 76ers recruit Jimmy Butler understands Joel Embiid's unhappiness after the All-Star voiced his frustration with his role. Embiid lamented his role in the 76ers' offense since Butler was acquired from the Minnesota Timberwolves in November, having sat out Friday's NBA win at the Detroit Pistons. Philadelphia's Embiid has struggled for form after he was just five-of-17 from the field for 10 points in a loss to the Eastern Conference-leading Toronto Raptors on December 5. Butler – who led the 76ers past the Pistons with his second successive 38-point game – was asked about Embiid's comments on Sunday and he told reporters: "I know where his heart is. His heart is pure. He wants to win. "I could feel for him. It's new for myself, it's new to him. It's new to everybody. But we're ok. I know he wants to win. "We need him, long term. He's been doing a lot on both ends of the floor for this team. That's our best player. I can understand being frustrated. … We'll figure out a way to make sure he’s always successful." Embiid has averaged 26.3 points and 13.3 rebounds per game this season. But he has shot just 29 percent from three-point range, which is the source of his frustration. On Sunday, 76ers head coach Brett Brown said "it's a natural reaction" for Embiid to want more touches in the post. "At times, it's true. He needs the ball," Brown added. "He can get the ball, from time to time, more than maybe he does. … It's a natural response, maybe driven at times out of the frustration of a loss, but it's not anything that is new to me." The 76ers will host the Pistons on Monday, carrying an 18-9 record into that matchup.